On Fire Marketing - Set Your Social Media Marketing alight! On Fire Marketing are experts in social media for small businesses, transforming smouldering accounts into trail-blazing marketing machines. Social media is now a business essential; your customers expect your social channels to be everything from customer service to company news to new products. By developing your brand voice and sharing interesting content, you keep your customers engaged building an army of brand advocates ready to buy. On Fire Marketing is the brainchild of Michelle and Dave; it began in 2012 after they realised small businesses were being left without a voice on social media. For smaller companies without big marketing budgets, increasing visibility online couldn’t be about simply throwing money at it – so instead it was about spending it wisely. Without the overheads of a typical agency, we can offer a great service at an even greater price. Having trained as a journalist and broadcaster, working to short deadlines in busy newsrooms honed Michelle’s ability to deliver the right message in the right tone to perfection. With nearly a decade of client-side and agency social media experience, she fully understands the challenges from all sides. Having studied English Language and Fine Art, Dave’s creative tendencies can give a new viewpoint and refreshing twist on content marketing. Dave has held technical and advisory roles in a range of sectors such as financial administration, insurance and payroll, so he knows full well there are a number of ways to get your message across and make sure you’re fully understood. 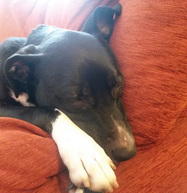 Dennis was adopted from Manchester and Cheshire Dog’s Home in 2014 and underwent intensive training in marketing. This has been abandoned, as he insists Windows 8 is perfect and that MiniDisc is the format of the future… although he does insist that all visitors offer belly scratches.